The view west along Oxford Street in December 2006, showing Selfridges department store in the background. 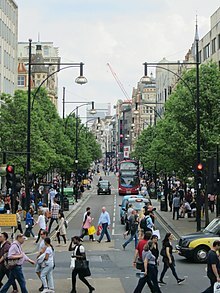 Oxford Street is a major road in the City of Westminster in the West End of London. It is Europe's busiest shopping street, and has about 300 shops. The street forms part of the A40 road, which connects London to Oxford. Like many roads in central London which are no longer through routes it is not signposted with the road number. Roughly halfway along Oxford Street is Oxford Circus, a busy intersection with Regent Street. A diagonal crossing at Oxford Circus opened in 2009, currently the only one of its kind in central London. ↑ "Land Securities to spend $1.1 billion on London developments". Bloomberg L.P. 19 January 2010. Retrieved 29 January 2011. ↑ "Oxford Street gets its own dedicated local police team". The Londoner. 2006. Archived from the original on 30 September 2007. Retrieved 19 June 2007. This page was last changed on 17 January 2019, at 12:57.